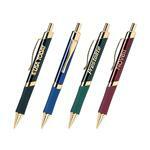 The Vienna Custom Metal Pen. 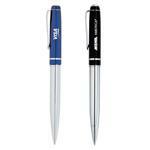 Classic push action retractable with silver accents and black or blue ink. (default is blue ink) Silver engraved imprint matches silver accents. This is also available in pen, pencil and pen/pencil sets! Free straight line copy setup or $40 laser engraving setup. Available Colors: Black; Champagne; Light Blue; Navy Blue; Red. Vibe colors include Berry Purple, Burnt Orange, Island Blue and Lime Green. Production Times Available: 7 working days standard. Inquire for rush. Typical Imprint Area(s): 1-3/4"W x 3/16"H per side or 2 lines of 32 characters. Available Imprint Options: Laser Logo. 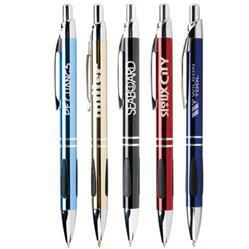 Vienna Metal Pens, Grip, Blue or Black cartridge. 4 pounds per 50 pens appox.